WWE / YouTubeRonda Rousey’s first interview as a WWE champion. Ronda Rousey looked like “a woman possessed” as she bulldozed through Alexa Bliss at the SummerSlam event on Sunday. Rousey played cat-and-mouse in the ring, slammed Bliss on her neck, and won her first WWE title – the Raw Women’s championship – in a four-minute ruckus at the Barclays Center in Brooklyn, New York. You can watch the match’s key moment right here. Ronda Rousey is the new WWE Raw women’s champion after she bested Alexa Bliss at SummerSlam on Sunday. Rousey only signed with sports entertainment brand WWE six months ago, but during that time she has stamped her authority all over the organisation. In just half a year, Rousey slammed her boss through a table during a scripted moment on live television, “blew the roof off the joint” in her professional wrestling debut, and was slapped with a “30-day suspension” when she “attacked” her WWE mentor with a briefcase in June. Since she returned to the ring, Rousey has continued to attract headlines and, most recently, bulldozed Bliss at one of the WWE’s biggest events of the year, the 2018 SummerSlam show at the Barclays Center in Brooklyn, New York. Rousey played cat-and-mouse in the ring as she set a trap for Bliss. She then dropped Bliss on her neck, and beat her opponent in just four minutes while looking like “a woman possessed,” according to the WWE commentators. Watch her neck drop move here. 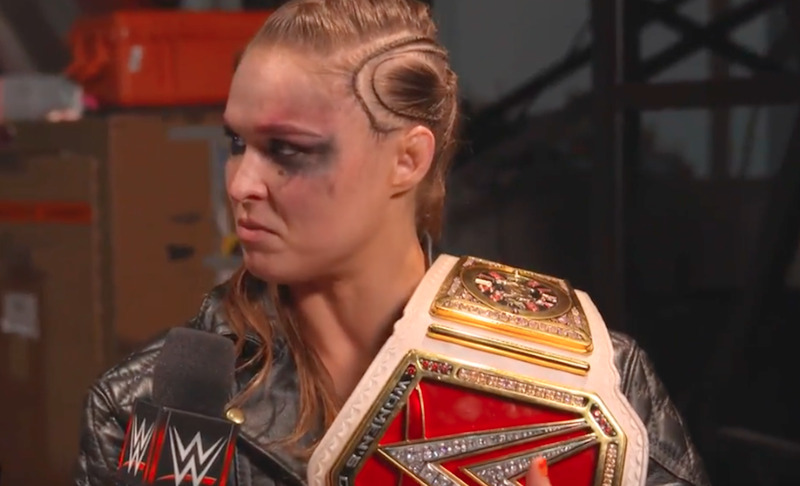 “This is a culmination of generations of women putting their bodies and hearts on the line over and over again, every single night,” Rousey told the WWE Network backstage after the match. In a 10-year career, Rousey has won an Olympic bronze medal in judo, the Strikeforce women’s bantamweight title in mixed martial arts, the UFC women’s bantamweight championship, and now the Raw Women’s title in WWE.